In December of 2015, a 94-year-old woman was inside a marked crosswalk proceeding with the "WALK" signal in her favor when she was tragically killed in a bus accident near Northgate Mall in Seattle. 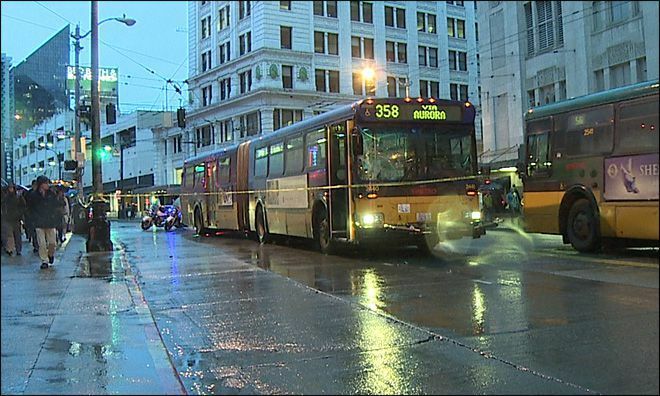 While inside the marked crosswalk the victim had the right-of-way over the King County Metro Transit bus. But the driver failed to yield. She was pinned under the bus and dragged some distance before she died from blunt force injuries to the head, torso and extremities. She was pronounced dead at the scene. After filing a lawsuit against King County Metro, Davis Law Group successfully negotiated with the county on behalf of the grieving family and reached a pre-trial settlement of $1,350,000. Click here to get more detailed information about this case. A senior citizen was stuck by a King County Metro bus while walking in a crosswalk. We obtained a $1,350,000 settlement for the greiving family.